Big City Indians started in 1997 with an exceptional intention: They perfected a unique musical hybrid that merged contemporary rock music, roots, pop and folk with an earthy, Native American flavor. These endeavors resulted in a rock band producing soulful songs and focusing on World Music. Big City Indians’ very special and outstanding blend of global and western style music also attracted the attention of the Music Industry: The band has garnered international awards, six Silver Arrow Awards and three Native American Music Awards in US including Best Group of the Year. In 2013 they solidify their commitment to the world’s largest environmental event “Earth Hour”; their single, “Earth Is Crying – Dry Her Tears” became the anthem for the official Earth Hour Austria. 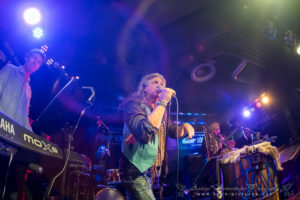 Five studio albums, several CD Compilations, DVD´s and many successful live shows in Europe and the US verify the magnetic energy of the Band’s concept: Based in Vienna, Big City Indians have created a unique and characteristic sound of their own, thus founding not only a strong reputation, but also a very loyal fan base. 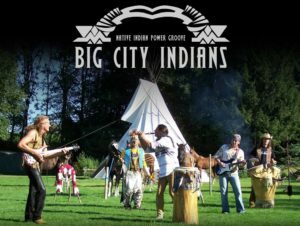 Big City Indians has been spreading this unique emotional energetic groove since 1997. The quintet has adopted an original sound and created a wider range of melodies incorporating influences of Native American musical tradition. The mixture of rock, roots, fusion, blues and continual songwriting attracts numerous tribal beats, mystic ethereal keyboards, rocking guitar riffs, mysterious whisper of Native American flute, funky basslines and meditative sounds. This creates a melting pot of sounds which is deeply grounded in the earth, reaching out to the heart of the listeners and speaking the common language of mankind . Big City Indians made history in Native American Music being the first Europeans ever to achieve the prestigious “Native Heart of the Year” award at the 12th and 13th annual Native American Music Awards in 2010 and 2011 and won a Nammy for BEST GROUP OF THE YEAR in 2013. Big City Indians are available for festivals & fairs, concerts, clubs, dances, seminars, school/children’s presentations, arts or museum appearances and events of any kind.